Our daughter Darcy has been ill so my stitching all but stopped for a week and I couldn't really get onto the computer for any decent time to catch up on my groups and favourite blogs. I did manage to put a little time into the Darcy photostitch which is growing nicely now. Thankfully she's all better now and Luke who also caught the virus is better. I did manage to get a lot of the confetti stitches completed on Thursday morning as Darcy went back to nursery so I sat down watching Lost In Austen and had a lovely relaxing morning. with the children around even the smallest task takes twice as long. I've also bought the fabric for DS2's dragon...he's been constantly asking when I'm going to start making him a dragon. It's going to be on red aida, I do prefer stitching on evenweave/linen but the red I found wasn't the right shade so had to go back to aida. I got a huge 1m piece of 16ct that I can also use for cards, ornaments etc. Now just need to get the threads as typically it calls for colours that I haven't got in my collection. 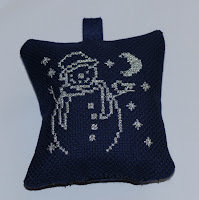 DS1 has seen another snowman from the Just Cross Stitch Ornament mag I bought and wants that stitching...thankfully it's a small one so shouldn't take too long. The boys have decided they want an ornament each making in time for Christmas but they want to pick the design. But I have finally put together his snowman that I finished last year but not in time for Christmas...hurray! I've also managed finally to stitch February on my french SAL by Maryse, only took me a couple of evenings when Darcy was on the mend so hopefully I'll get March done in the next week so I can go back to my Beau Bands SAL. My 2010 Olympic Reading Challenge is coming along...while Darcy was ill I spent quite a few nights sat on the sofa with her and ended up reading aloud to her....she quite enjoyed Beat Until Stiff by Claire M Johnson (a cooking murder/mystery), makes a change from her In The Night Garden book anyway! Everything seems to be back to normal with the kids (for a while anyway!) so I may manage to catch up on a couple of projects that have been put to one side. The F1 season has kicked off so I should get some stitching time in while the races are going. Thank you for all your comments, the encouragement has helped especially when I've felt like I'm getting nowhere fast. Glad everyon is on the mend. Great stitching! Lovely stitching! What a treasure you'll have when it's all put together! I'm glad the kiddoes are on the mend. Nothing like a nasty virus traveling through the house to mess life up! Well done, Jo, everythng looks lovely! Hugs to the treasures, hope everyone feels much better! I read on a blog that you shouldn't be ironing WiPs for photos - it doesn't do much for the threads, apparently. I am glad that Darcy and and Luke are feeling better. Your photo stitch is coming along beautifully and looks wonderful. I love the small calendar charts you have done as well and the snowman is adorable. What a wonderful idea to stitch each child an ornament of their choice. They will treasure them when they get older! I love the calendar squares! I can't wait to see it finished! I am glad to hear that you all are feeling better. I love the calendar pieces and can't wait to see the quilt. Your Beau Bands are coming along nicely. Your calendar pieces are quite lovely. Looking forward to seeing how you put them all together. 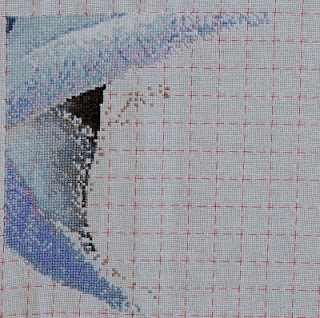 Glad to hear the kids are getting better and you'll have more time to stitch now. Love the calendar project and looking forward to see how you finish it. Nice stitching! Glad to hear your little one is feeling better. Great - what a fantastic finish - I couldn't even get through one, and I love the calendar!! Glad everyone is feeling better. Love the pictures you stitched for the quilt. Hi Jo! Just awarded you the sunshine award for being one of the first to encourage me in the world of blogging. Come on over and pick it up at my blog if I figured how to do it right. If I didn't, isn't it the thought that counts? OMgoodness - these poems are just beautiful!